The role Afghanistan’s vibrant media plays in public life represents one of the most significant changes that have taken place in the country since 2001. But that achievement is under threat, as journalists face growing intimidation and violence from both state and non-state actors. 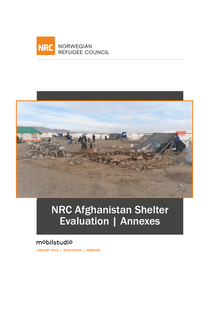 This evaluation focused primarily on temporary shelter solutions implemented by the Norwegian Refugee Council (NRC) in Afghanistan and examines how they link to transitional assistance and long term recovery measures. lert is a quarterly magazine published by Doctors Without Borders/Médecins Sans Frontières (MSF-USA) that features compelling stories and photography from our work in the field. Below is an excerpt from MSF-USA Board President John P. Lawrence's introduction to the Spring 2019 issue (Vol 20. No. 1. ), No Health Without Mental Health. Heading into the villages outside Kabul, snowy mountains rise into the distance ahead. Sand-coloured walls broken up by solid metal gates line both sides of the muddy road. Homes are concealed behind them for safety. Occasionally a child’s kite can be seen flying above a perimeter – a clue to the family life inside. In this part of Afghanistan, the legacy of forty years of conflict is similarly out of sight. There are no front lines here. No craters and no destroyed buildings. Nine provinces have been affected by heavy rains and flooding. More than 40 people are known to have died, and hundreds of others have been injured or are missing. Numbers are likely to change as assessments are ongoing. In January, 66,840 eligible refugees and asylum-seekers (32,714 families) received cash assistance in Greece, in 109 locations. 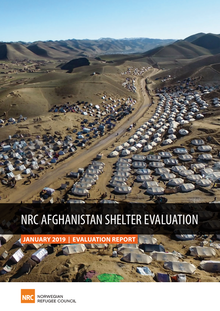 Widespread conflict and severe drought has forced over 150,000 people to flee villages in northwestern Afghanistan and seek shelter in the city of Herat. Their condition remains extremely fragile, as they face shortages of food and limited access to healthcare. Médecins Sans Frontières (MSF) opened a winter clinic in Herat to provide much-needed assistance to these vulnerable people. Little Bibi Hawa is four years old. She has been suffering from pneumonia and fever for four days. Her father, Agha Muhammad, is very worried. 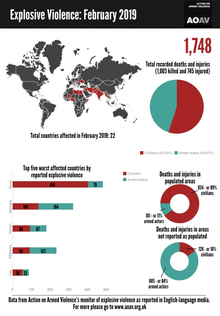 In February 2019, Action on Armed Violence (AOAV) recorded 1,748 deaths and injuries from 206 incidents of explosive violence around the world, as reported in English-language media. 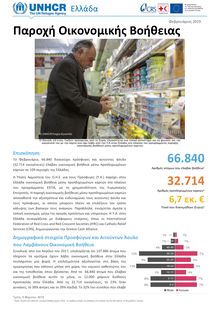 Civilians accounted for 55% (962) of the deaths and injuries recorded. 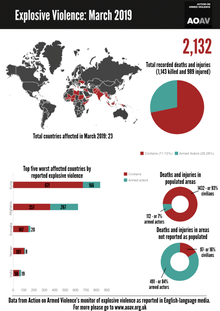 When explosive violence was used in populated areas, 89% of all casualties were civilians, compared to 16% in other areas. 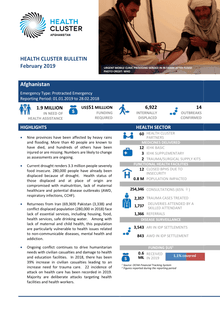 On March 7th 2019, mortars were fired on a political gathering in Kabul, Afghanistan, in an attack that left 11 dead and 95 wounded. The bombardment took place in Kabul’s western neighbourhood of Dasht-e-Barchi – an area predominantly populated by ethnic minority Hazaras – as the public gathered to remember Abdul Ali Mazari, a leader of the Hazaras, killed by the Taliban in 1995. The basic health care and hospital care in the provinces of Kunar (pop. 482.115) and Laghman (pop. 476.537) have been awarded as of the beginning of 2019 to HealthNet TPO Afghanistan.